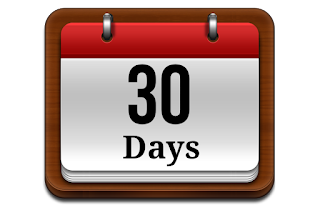 I made it through my first thirty days of being gluten free!! There have definitely been a few challenges so far along the way (and I still have a long way to go to see if this is making any difference for me) but overall it hasn't been too bad. It gets tricky when eating out but thankfully more and more people, restaurants, and companies are becoming more aware of various allergies and intolerances and are willing to make the appropriate accommodations and offer acceptable alternatives. This bread reminded me of cornbread. The other brand thats good is called Udi's. Wegmans has a pretty good gluten free section of baking products. There is also an all-purpose baking mix (like bisquick) thats good for pancakes. if you want to make baked goods from scratch go with Bob's Red Mill 1 to 1 baking flour. You won't notice a difference! You can use it just like regular flour. One handy thing I've learned, is being prepared goes a long way. The internet is a land of wonder in this regard. I can go online and look up just about any restaurant and get detailed nutritional and allergy information about their entire menu. Then I make a list, which I keep in my Notes on my iPhone, as to which restaurants have GF options for me to choose from. So when its Friday night and my husband asks me, "where do you want to go for dinner tonight? what can you eat?" All I have to do is pull up my handy-dandy list and say, "let's go here!" Don's Wood-fired pizza has a gluten free crust. Only available in this size but you can get whatever toppings you want. Some people don't like it but I do. Its thin and crispy like a cracker. This is my 5 Guys option...same burger, no bun, and all fresh ingredients! Their fries are GF as well (some aren't so you have to check!) And sometimes, just because a particular item is GF does not exclude it from the possibility of cross-contamination, so you have to check that too if you have a higher sensitivity or allergy. All in all, I'm staying on track and keeping my fingers crossed that it continues to go well. Hopefully in a few months I can declare that I truly am gluten free as all this poison has worked its way out of my body and I can start to feel like a normal human being. baked potato, veggies, and fruit!! sauteed mushrooms as a Thanksgiving side! Market Burger in Purcellville offers GF buns and fries! 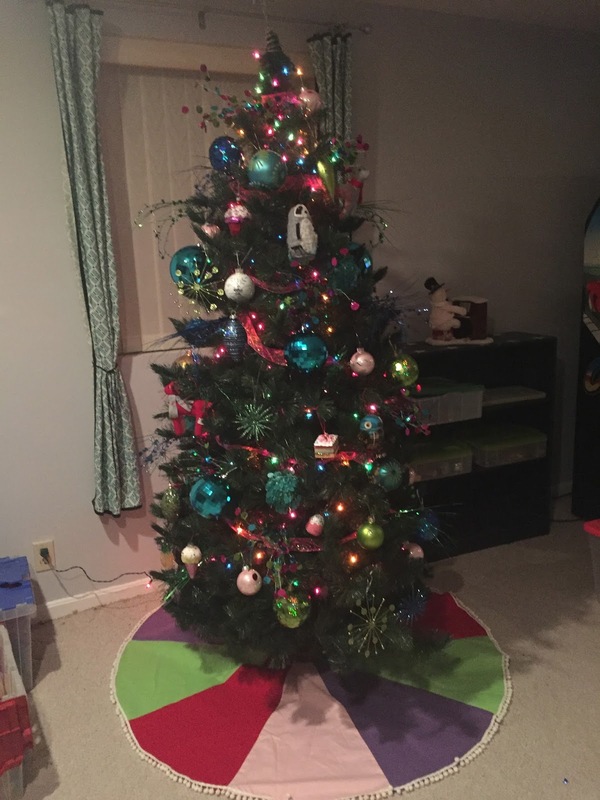 Pablo gives his approval on the tree! But I digress...this post is supposed to be about food right?! Here it comes...on our way back from getting our lovely fat tree, we stopped in a little town called Purcellville for lunch. There's a little gourmet burger joint there we'd heard about called Market Burger and Fries, right in the center of town. 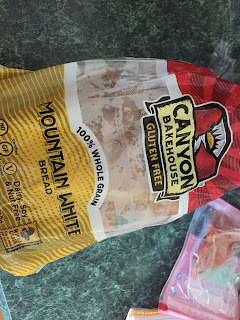 Now as you may know, I've recently started on this gluten-free venture, which can make things difficult when eating out. However, sometimes it just takes a little planning to know where and what you can eat. I had already researched their menu ahead of time and noticed they had the option for gluten free buns. my fake basement tree...bright funky colors! Alot of their offerings...meat, veggies, cheese, etc... are from local farms, which is an added bonus. And lo and behold, I was surprised to find out their fries are gluten free also! Some fries are gf and some are not, so its nice to be able to have some that are!! They were the best fries I've had in a long time! a few of the tables were covered with bottle caps! We both to get their signature burger, the Market burger...cheddar cheese, bacon, egg, herb mayo, lettuce, and tomato. I got mine with the gf bun, of course, and sans egg. My official review...4 stars. 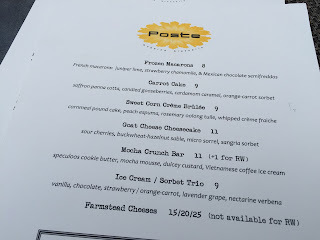 It was a good burger and a fun atmosphere, However, not as good as Melt, which is a top favorite, and its a bit pricey. Almost $40 for 2 people (and we shared the fries)! Don't regret it, its always nice to splurge a bit and have some good food, and try out a new place. But in the future, when we want a gourmet burger, we'll head to Melt!! burgers and fries...gf bun has seeds! So I've deiced to try going gluten free. I know it sounds like its just the latest in a sea of new food trends. But for me its not a trend. Its a way to better my quality of life, a desperate attempt to feel better, to feel normal. You see, I have several health issues that cause me daily aggravation and discomfort, sometimes even pain, among a myriad of other symptoms. One disorder I deal with is Hashimoto's Thyroid Disease. It is auto-immune disorder where my body attacks and seeks to destroy my thyroid gland. The thyroid affects a lot of stuff in your body…temperature, weight, metabolism, hormone balance, causes dry skin, hair loss, lethargy/fatigue, infertility, anxiety/depression and other mood disorders…the list goes on and on. And these are just a few of the things I contend with every day. Not to mention that when you have one autoimmune disorder you are much more likely to develop other autoimmune disorders. One of which is celiac disease, the most commonly associated with gluten allergies. I, thankfully have tested negative for celiac disease. However, the Hashimoto's also makes you susceptible to having a gluten intolerance, even without actually having celiac disease. 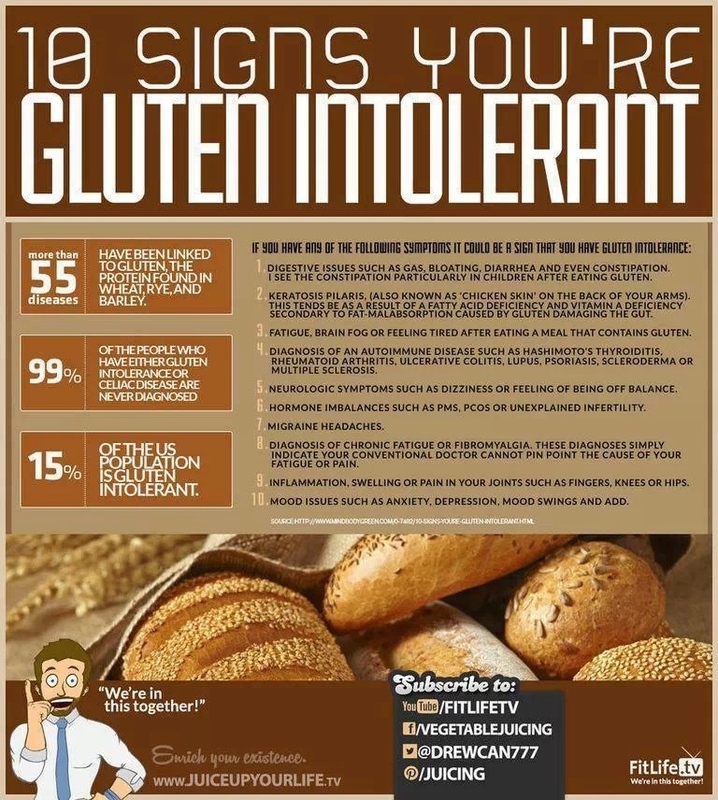 Below is a list of just some of the symptoms you might have if you're gluten-intolerant. 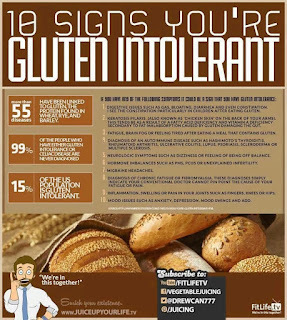 Out of the 10 on this list, I have 7, and the other 3 I've experienced on occasion, which may or may not be related to gluten. At first I considered just trying to cut back on gluten instead of cutting it out all together. 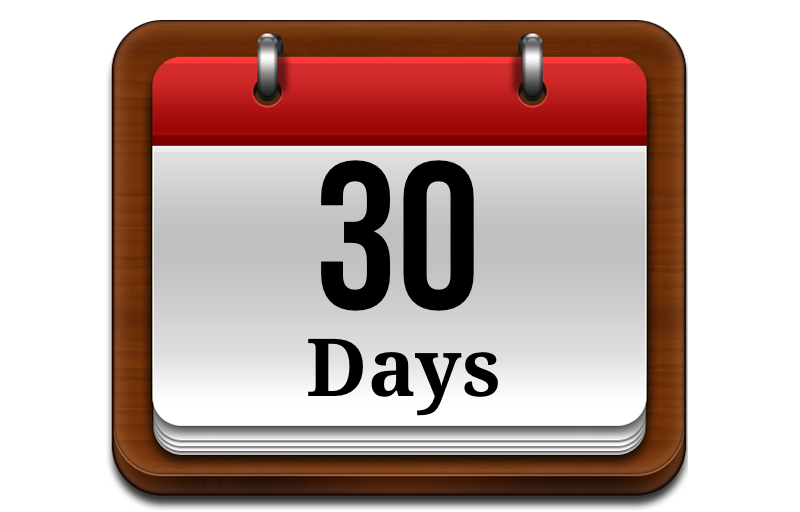 But that notion was quickly dispelled when I found out that gluten can stay in your system for a very long time…like 3-6 months. So theres no point in just cutting back if its still in your system that long. 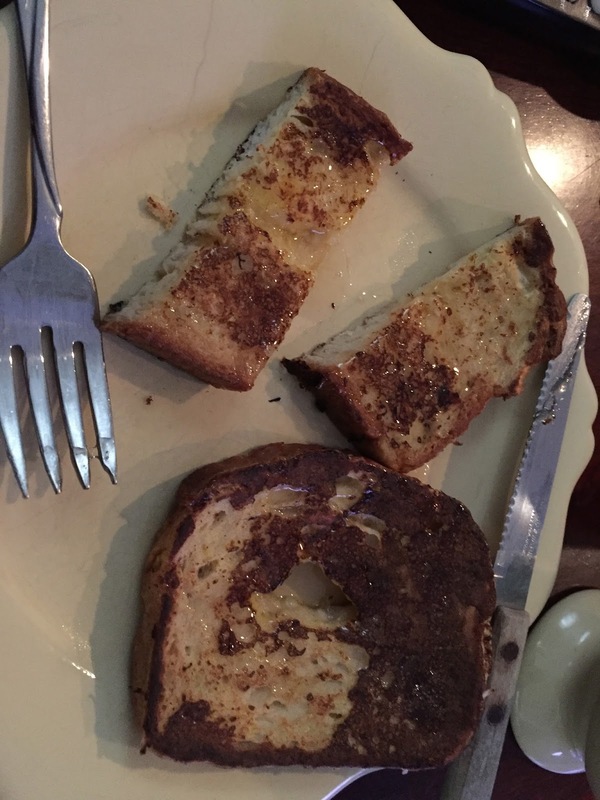 Every time you add another bite of gluten, it just takes that much longer for it to go away. So gluten free 100%. It seems daunting at first. Wow, I can't have pizza, I can't have burgers, I can't have pasta or cake or cookies, or this or that or the other favorite thing I love to eat! Its even hidden in some sauces (I love sour cream!) and soups as a binder! Aaaahhhhh! What in the world am I going to eat?? And gluten free food, does it even taste good? Will I ever be able to enjoy food again?? Whew…deep breath. Its really not that bad. Yes there will need to be changes. And yes it will be for a lifetime. But there are a lot of tasty options that are still available. There are many gluten free flours, pastas, and breads available. Some grocery stores that have gluten free sections and even many restaurants are starting to offer gluten free items on their menus as well. So here we go, entering into this new culinary adventure with an open mind and an open stomach, with a glint of hope that in a few months, my body will start to feel normal and more healthy. Maybe I'll even lose a few extra pounds in the process! If you have any gluten free recipes you'd like to share, I'd love to hear them!! So wish me luck!! my first gluten free meal…a sweet potato with butter and cinnamon, and a chicken salad with fresh veggies, a little blue cheese, and Italian dressing. Make sure you check the labels even on the dressings…all the other dressings I looked at were not gluten free, beware of soy as well! Have I mentioned how much I love tacos? 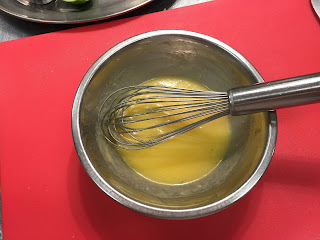 A few weeks ago I shared how we did a stay-cation week, and one of the fun things we did was participate in a Cookology class making fusion tacos! We've done a couple other Cookology classes before, one was Italian and one was Greek. If you've never done it, you should. Its tons of fun, you can learn some great kitchen tips, and at the end of it, you get to have a tasty meal with unique food you didn't know you could make. We made three kinds of tacos: a Korean beef taco, a spicy Thai chicken curry taco, and a dessert choco-taco! The first thing you do is set out and organize your mise-en-place, a French term meaning "putting in place' or in other words, you're setting up your basic ingredients you'll need to get the dish started. 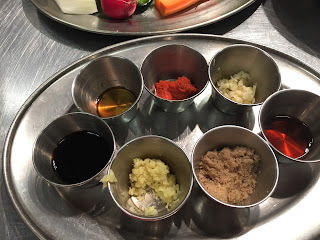 Our mise-en-place consisted of one tray of veggies and one tray of spices and sauces we would need to make our dishes. Our veggies were carrot, lime (yes I know this is a fruit), jalepeno, white onion, green onion, cucumber, radish. Our spice tray consisted of soy sauce, sesame oil, kochujang (a spicy bean paste used in a lot of Korean food), minced garlic, fish sauce, brown sugar, and ginger. For the Korean Beef taco, we made a marinade for the beef from crushed pear, onion, garlic, ginger, soy sauce, brown sugar, black pepper, sesame oil, and carrot. While that marinade was working its magic tenderizing the beef, we made a cabbage slaw. We chopped a couple different kinds of cabbage, added finely sliced pieces of cucumber, green onion, a little sunflower oil, a little vinegar, and a little salt to taste and mixed it all up. Then we started on the Thai chicken tacos. We chopped up some chicken that was already cooked to save time in class and added it to a pan with olive oil. Next we added coconut milk, kochujang paste to taste, and fish sauce. Then also add garlic and jalepeno, also to taste depending on how spicy you want it. You can also add other veggies to the chicken mixture or put them on raw at the end. We added our radishes to the pan while cooking. And topped the tacos with cilantro and lime when it was time to serve and eat. 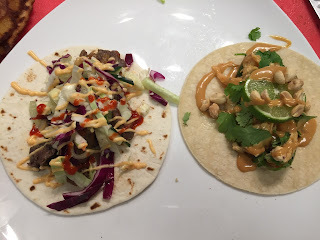 For these tacos we used a corn tortilla and they were topped with a peanut sauce (it was already made for us in class but its easy to make at home too: peanut butter, soy sauce, siracha, and maybe a touch of warm water) and crushed peanuts. When it was time to assemble our beef taco, we cooked the beef in a pan with the marinade. We topped a flour tortilla with the beef mixture, the cabbage slaw, a little siracha mayo sauce, and a drizzle of plain siracha to taste. But we weren't done yet! Now it was time for dessert! 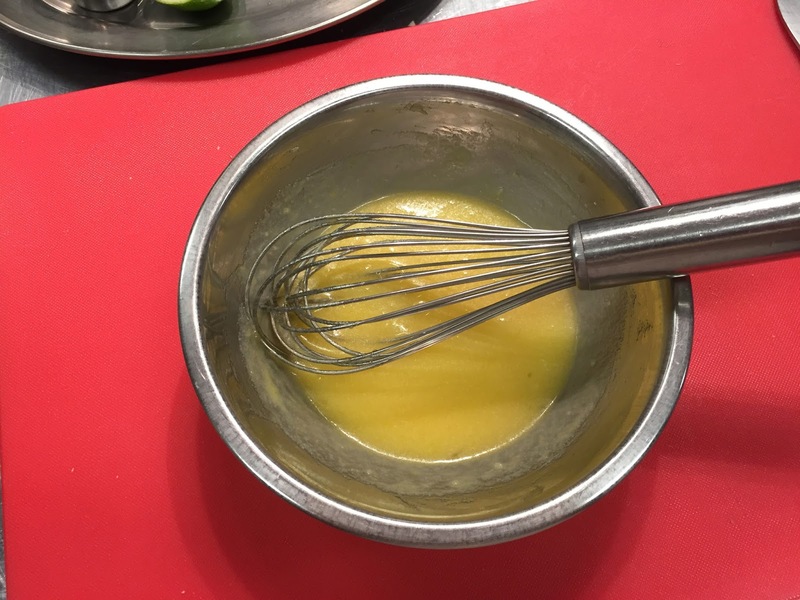 We made a batter, similar to pancake batter but we wanted it to be thin like a crepe. Next we put the batter in a hot pan like we were making a pancake. Now anyone who has kept up with my blog knows I have a hard time making pancakes because I get scared of "the flip". I just recently was able to do this flip successfully for the first time ever! Now I have to flip this big one!! Chef Mark, our teacher gave me a few tips and told me to go for it. Ok here goes...I did it!!! Perfectly, in fact! We all cheered! It was a triumph! Once the crepe/pancake was done but still warm, we laid it over the handle of the pan so it would curve like a taco as it cooled. 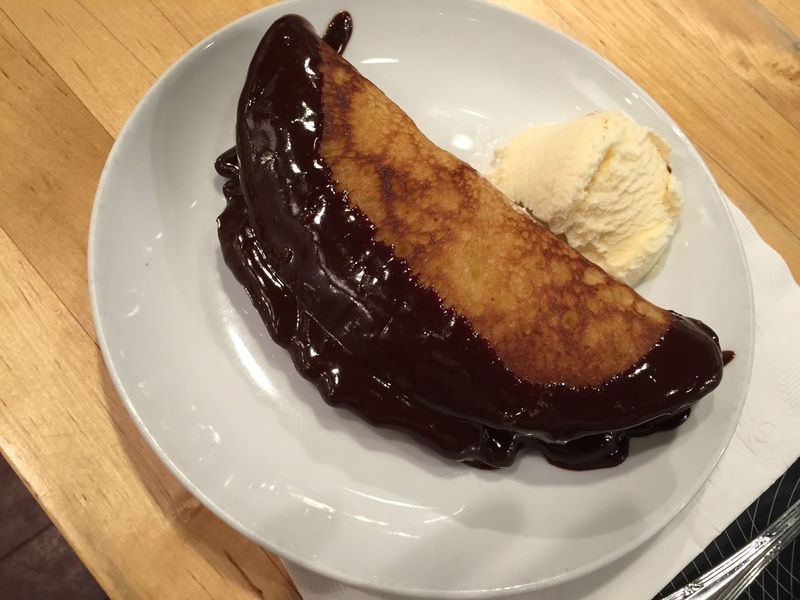 Then we dipped the edges in a chocolate ganache and served it with vanilla ice cream. Everything was super delicious! The chicken taco was sweet, creamy, and fresh with a little spicy heat while the beef one was hearty and savory with its own level of spice. The dessert one was fun to make and a nice sweet treat to cool our tongues from the previous spice. Our teacher, Chef Mark, was very encouraging and informative. And we got a tasty meal that we can now easily make at home! Can't wait to try it in my own kitchen! Last week, on the 21st of August, my husband and I celebrated our 16th wedding anniversary!! Yep, we've actually made it that long and are still in love! It hasn't always been easy but we've always stuck together…okay enough of the cheesy, mushy stuff! Anywho…so we took the day off from work to relax and do some fun stuff. We ended up going to see the movie Shaun the Sheep (which is very cute and funny…big fan of Wallace and Grommet and most things from Aardman Studios) at the Alamo Drafthouse in One Loudoun. If you haven't been to the Alamo, you need to go check it out. The theaters are very nice and small, which is good because you know it won't be overcrowded. You have the option to assign your own seats and they serve food like in a restaurant, with a waitress and everything. And I have to say, I was surprised how good the food was the first time we went. Its nothing spectacular or 5 star but its like upscale bar food and everything we've had has been pretty tasty. Unfortunately I don't have any pictures because 1. its dark in there, and 2. they are very strict about no cell phone use. But we've tried their loaded fries, a couple pizzas, and fish 'n chips. Everything was delicious and not very overpriced. They also have a few different sodas for those who are more drink connoisseurs. If there is a unique drink offered, I'm probably gonna try it. They have homemade root beer, which is probably my favorite soda, and they also offer Italian sodas which are sweet and creamy! hotel bathroom...never seen a sink like this before! hotel lobby...love the green glass chandeliers! Later that night we went downtown to have a nice dinner in the Penn Quarter area of DC. 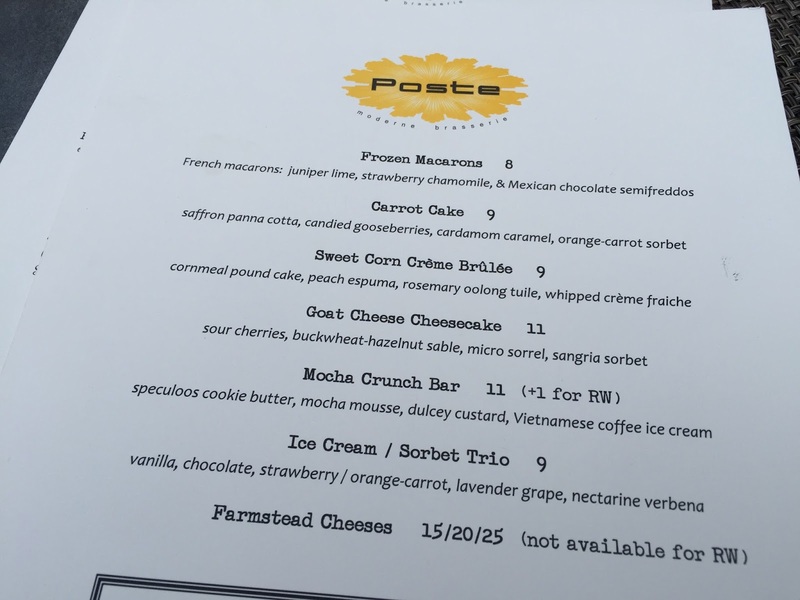 There are a ton of good restaurants in that little area and there was one we've had our eye on for quite a while, called Poste. It serves French-American cuisine and it sits in the middle of the Hotel Monaco. That evening the weather was very tolerable for being August so we got to dine outside in the courtyard. It was a beautiful night and the food was delicious! First we were served an amuse bouche…a little kiss or taste from the kitchen. 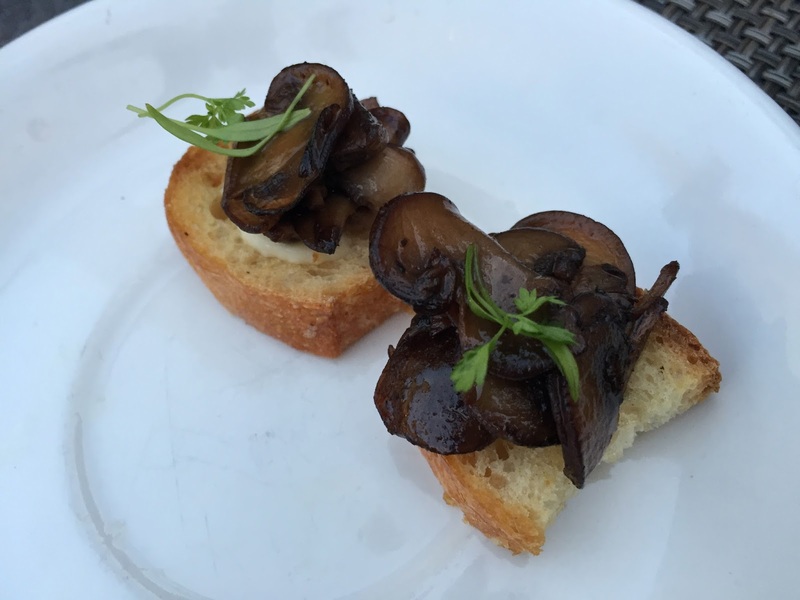 A roasted mushroom crostini…savory, earthy, just melts in your mouth! A good sign of things to come! It just so happened to be restaurant week when we were there so we got to take advantage of some specials. If you choose to order from the restaurant week menu, you get an appetizer, entree, and dessert for $35. Not bad at a place like this. Hubby is not a dessert guy so he didn't take this option. But we both ordered an appetizer. I chose the crispy duck ravioli. 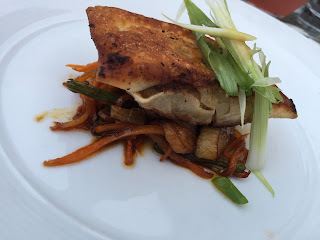 It was a large crispy wonton stuffed with juicy, tender duck meat that had been braised with Asian flavors, served with a caramelized onion and carrot slaw, and drizzled with a soy garlic sauce. A good combination of sweet and salty. Hubby's appetizer was wagyu tartare, basically raw wagyu beef that was served like a terrine on a crostini. It was prepared with pine nuts, arugula, parmesan, and truffle vinaigrette, and topped with potato croutons (like fancy tater tots!). If the thought of raw beef scares you, you are missing out on a good thing! Trust me, its yumma yumma! Then for the entrees: steak frites and halibut. The steak frites is a 12oz ribeye served with truffle fries and a couple of savory dipping sauces. What's not to like? For me, I chose halibut, a bit of a lighter dish because I was holding out for dessert! The halibut was pan seared and served with sautéed pea leaves, wild mushrooms, ramps, and a chili oil sauce. 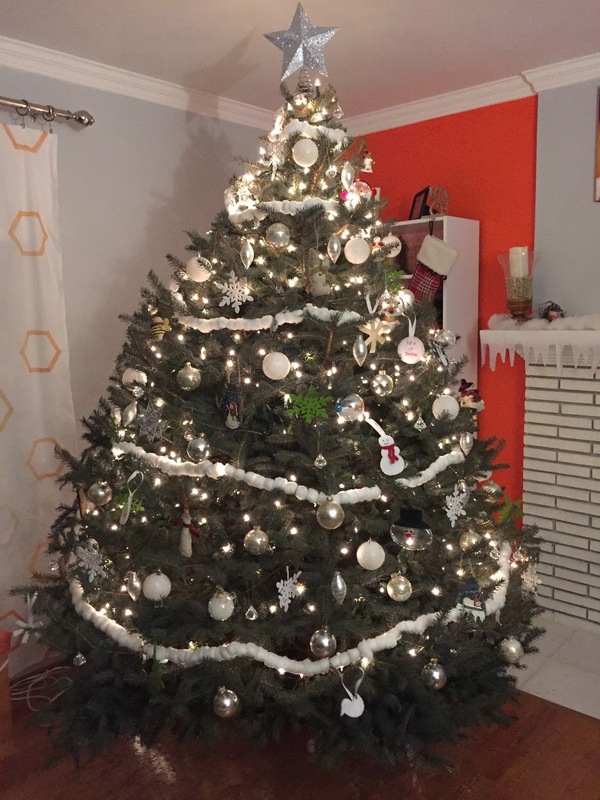 It was light and fresh! The sauce made even the greens taste good! Then came my favorite part: dessert! I'm a sucker for goat cheese, especially when it comes in a cheesecake! This goat cheese cheesecake was served with sour cherries, buckwheat-hazelnut sable, micro sorrel, and sangria sorbet. Ok so first, a definition lesson. I actually had to look up a few of these words while at dinner so I would know what I was eating. Let's start with the buckwheat hazelnut sable. This is essentially a fancy thin crispy shortbread style cookie. It sort of had a nutty, slightly bitter taste. That might sound like a bad thing, however, the bitterness created the perfect balance for all the other flavors there. Next definition: micro sorrel. Sorrel is a type of green herb and micro just means it has small leaves. Yes there was a green herb in my dessert! It was a little strange but somehow it worked! The whole dessert had every flavor combo…sweet, bitter, savory, tart, salty. As much as I love the whole over-the-top-chocolate-peanut butter things, these kind of unique desserts end up being some of my favorite. Unexpected flavors that tantalize every area of your tongue! 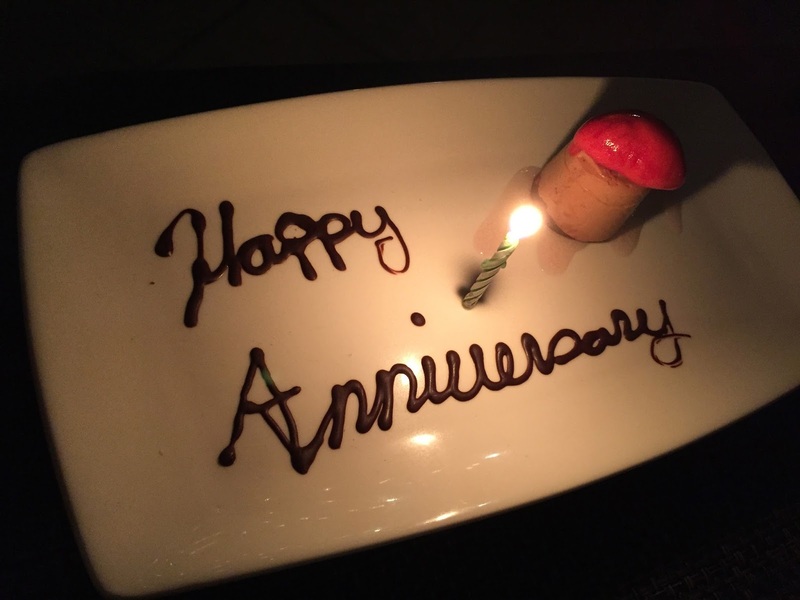 And since it was our anniversary, the staff also brought out a special surprise! A miniature chocolate coffee mousse cake topped with strawberry sorbet! Hubby only took one bite so it was up to me to finish my own dessert and this one before the candle burnt out…I won! And THEN, as if that all wasn't enough, while we were waiting for our check, they brought us out another amuse bouche…some kind of little almond sponge cake topped with apricot jam, I believe. So instead of an after-dinner mint, we got after-dinner cake! On our recent stay-cation we took a day and went to DC. Our first stop was the Spy Museum which was pretty cool and very interesting. It definitely makes you look at people differently. I mean, how many people do you walk by every day that could be spies?! Who knows?! At any rate, all that spying made us hungry. So afterwards we went to lunch at Union Market. So many vendors to choose from with lots of tastiness. As much as we like trying all different kinds of ethnic foods or unique foods, we were drawn to the smoky aromas of some good ol' Southern barbecue! We split a meal of brisket with two kinds of sauce, and a bowl of baked beans. The brisket was sweet and tender and juicy! And the beans were unlike any other baked beans I've ever had. There was a mixture of several types of beans, tomatoes, peppers, onions, and spices. I'm generally a little picky about the kinds of beans I like to eat and when I order baked beans, I expect the traditional variety. However, these were pretty darn tasty! I would eat those over and over! Delish! Next we decided to try some empanadas. DC Empanadas actually has a food truck as well as kiosk here at Union Market. We've eaten at their food truck before so we already knew these would be yummy. We got one cheese one and one beef one. The cheese one, also known as Speedy Gonzalez, was nice and gooey and salty with a mixture of 3 kinds of cheese: queso blanco, asadero, and mozzarella. The beef one, called El Toro, had chipotle seasoning, onion, garlic, cilantro, cheese, blakc beans, and corn. A little spicy, a little cheesy, very savory. Can't wait to go back to Union Market in the fall to celebrate the Crafty Bastards craft show!